A rare and limited collection of hand finished / decorated 925 quality Dutch and Sterling Silver Art Nouveau Brooches and Pins the designs of which are inspired by, and taken from the original 'Design Masters / Templates' of 'Royal Van Kempen and Begeer'. Art Nouveau Brooches of lady, with a skin toned part frosted look over Silver, in flowing dress, set within a floral leaf frame decorated by hand with Champleve enamelling. 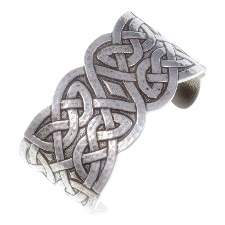 The design is by: Henri Vever (1854-1942). 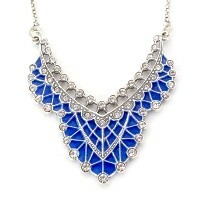 This Item can also be worn as a pendant, chain NOT supplied. Art Nouveau Lily Brooches set with Swarovski Crystals and centre piece Pearl. 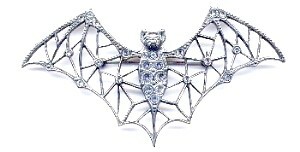 The Art Nouveau motif is a design by the American Firm Tiffany & Co.
Art Nouveau Bat Brooches, full facing, with fully extended open framed wings set with multible Swarovski Crystals to both body and wing frame. 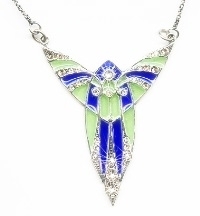 Art Nouveau Plique a Jour Butterfly Brooches with broad double open wings, decorated by hand with deep Blue and Green Plique a Jour enamelling with ornate and elegant main body, and encrusted with multible Swarovski Crystals. Art Nouveau Fairy Brooches of ornately winged silver fairy clasping posy of flowers, with a skin toned part frosted look over Silver. 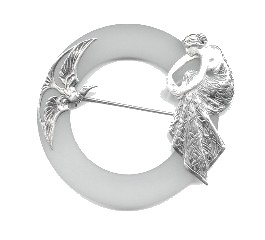 Art Nouveau Male Fairy Brooches with double outstretched patterned silver wings set with Swarovski crystals, and with a skin toned part frosted look over Silver. 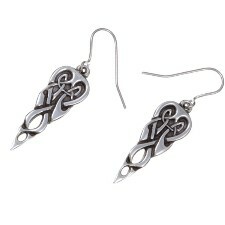 The design is inspired by: René Lalique (1860-1945). The design is by Luis Masiera (1872-1958). 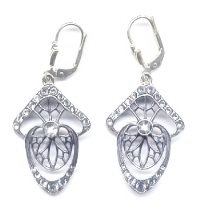 Art Nouveau Brooches of ornately patterned silver dressed lady with a skin toned part frosted look over Silver, clasping a Pearl. 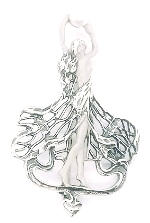 Art Nouveau Brooches of dancing lady with a skin toned part frosted look over Silver, in flowing frame dress, hands raised, clasping a single Pearl above her head. 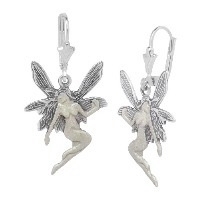 Art Nouveau Fairy Brooches of double open slim winged fairy in an ascending pose, with a skin toned part frosted look over Silver. 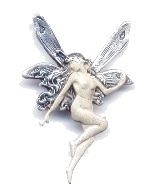 Art Nouveau Fairy Brooches of double open broad winged fairy nymph in a rising pose, with a skin toned part frosted look over Silver. Art Nouveau Butterfly Fairy Brooches with outstretched patterned butterfly wings, with a skin toned part frosted look over Silver. Art Nouveau Brooches / Pendants of the Ginkgo Leaf. The leaves of the Ginkgo Bilboa tree are a symbol of long life, hope and happiness and their beautiful original shape has often inspired Art Nouveau artists. 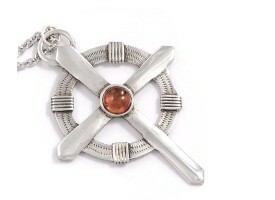 Can also be worn as a pendant, chain NOT supplied. 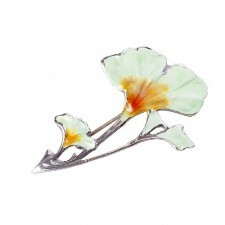 Art Nouveau Brooches / Pendants of Ginkgo Leaf. 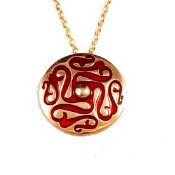 Decorated by hand with Champleve enamelling. 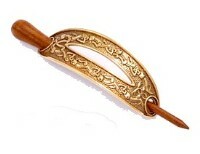 Art Nouveau Brooches with open vine leaf design within oval frame. Art Nouveau Plique a Jour Butterfly Brooches with double open wings, decorated by hand with deep Blue Plique a Jour enamelling and set with Swarovski Crystals. 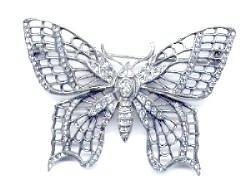 Small Art Nouveau Butterfly Brooches with double open dark silver patterned wings. 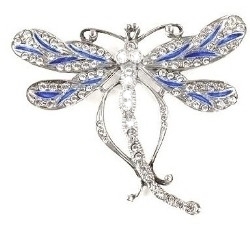 Art Nouveau Plique a Jour Dragonfly Brooches with double open wings, slim elegant extending main body and attached rear legs, set with multible Swarovski Crystals, and additionally decorated by hand with deep Blue Plique a Jour enamelling. 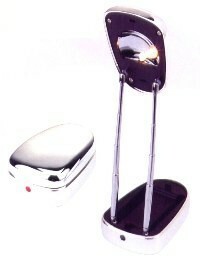 Finish: 925 Quality Dutch / Sterling Silver, 'Plique a Jour' enamelling and Swarovski Crystals. 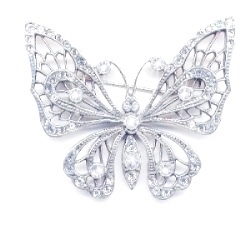 Art Nouveau Butterfly Brooches with broad double open wings, ornately detailed and elegant main body, and encrusted with multible Swarovski Crystals..
Art Nouveau Butterfly Brooches with broad double open wings, ornatel and elegant main body, and encrusted with multible Swarovski Crystals..
Art Nouveau Dragonfly Brooches with double open wings, slender elegant main body curled back towards the wings, set with multible Swarovski Crystals. Large Art Nouveau Plique a Jour Dragonfly Brooches with triple open wings, decorated by hand with Plique a Jour enamelling set within a filigree type wing stucture. 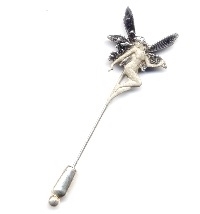 Art Nouveau Fairy Stick Pins with double open slim winged fairy in a rising pose, with a skin toned part frosted look over Silver. Art Nouveau Fairy Stick Pins with the head of an elegant Art Nouveau lady, with a skin toned part frosted look over Silver. She is based on the French actress Sarah Bernhardt. A typical piece of Alphonse Mucha (1860 - 1939) jewellery. 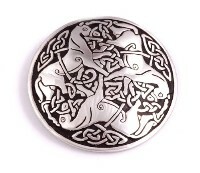 This pin is a slight variation on the pin above.